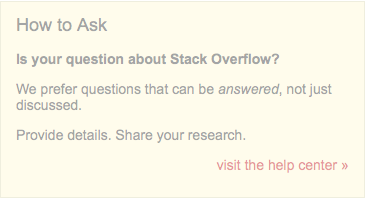 If you submit a question without filling in the title, body or tags, error messages appear. When the error messages come up, the "How to ask" area is grayed-out. If you scroll down to the point where the grayed-out "How to ask" panel passes above the top of the screen, it suddenly disappears. Grayed-out "How to ask panel." Scroll down a little...and it suddenly disappears! NOTE: I'm not simply scrolling it out of view. When the top edge of the "How to ask" panel touches the top of the browser, it just vanishes. Browse other questions tagged bug asking-questions .